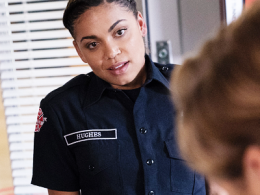 Revolving around a team of fire fighters stationed just a few blocks away from the fictional Grey Sloan Memorial Hospital, “Station 19” focuses on firefighter Andrea ‘Andy’ Herrera (Jaina Lee Ortiz), who is also the station captain’s daughter, and how she navigates her professional and personal life. Which, this being a Shondaland production, includes a love triangle between her high school sweetheart and her boyfriend, who also happens to be the station’s lieutenant. One of the station’s rookies is married to “Grey’s” Miranda Bailey (Chandra Wilson) and when the station must bring patients to the Grey Sloan Memorial Hospital, Ellen Pompeo, Wilson and other “Grey’s Anatomy” stars are there make occasional cameos. Ortiz is in good company with Barrett Doss and Danielle Savre playing Victoria ‘Vic’ Hughes and Maya Bishop, two strong female leads in a male-dominated profession. The three women are not afraid of running into burning buildings, or standing up for themselves, especially when they are underestimated. Ortiz added it’s the first show where she has had all female bosses, including McKee, who worked on all 13 seasons of “Grey’s Anatomy.” It’s also the first time she has worked with a female camera operator. From hosing down fires to swinging an ax, the cast members didn’t shy away from getting their hands dirty. Though there was some physical preparation beforehand, a lot of training happened on the job, making for sore muscles at the end of each day, Doss said. Jumping off a building in flames, however, was one stunt the cast wasn’t allowed to perform. 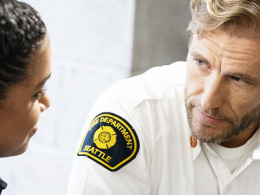 As someone who doesn’t follow “Grey’s Anatomy,” Okieriete Onaodowan, who plays firefighter Dean Miller, said he thinks viewers will still enjoy learning about what goes on in fire fighters lives, personally and on the job. For lovers of the hospital drama genre, “Station 19” will complete the picture, added Alberto Frezza, who plays police officer Ryan Tanner. “There’s drama every turn there’s love triangles, the cliffhangers,” she said. “How each episode is kind of a lesson, it starts off with a problem and at the end, Jaina’s character Andy has an answer to that problem. If you look away, you might miss something. Miguel Sandoval, who plays captain Pruitt Herrera, said the show’s quick pace speaks to McKee’s writing abilities. 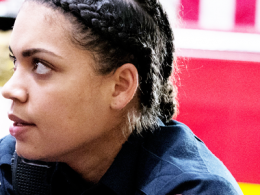 The fact that the lead character of “Station 19” is from a largely underrepresented community is an added bonus to an already diverse cast Ortiz said. Ortiz grew up speaking English, and though her character’s fluency in Spanish was a bit difficult; found speaking Spanish on the show uncomfortable, she felt it was a way for her to pay respect to her culture and shine a light on the Latino community. Sandoval called the casting crew “colorblind,” because they cast for talent that will push their stories forward.